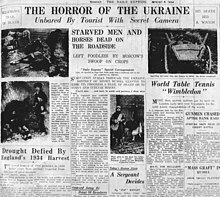 It has been suggested that this article be merged with Causes of the Holodomor. (Discuss) Proposed since April 2019. Davies, Robert W.; Wheatcroft, Stephen G. (2002). 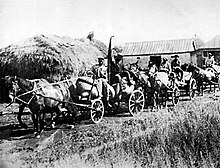 "The Soviet Famine of 1932–33 and the Crisis in Agriculture" (PDF). In Stephen G. Wheatcroft (ed.). Challenging Traditional Views of Russian History. Houndmills: Palgrave Macmillan. ISBN 978-0-333-75461-0. Mace, James E. (2004). 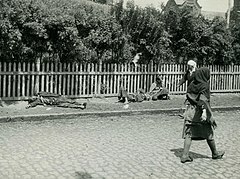 "Soviet Man-Made Famine in Ukraine". In Totten, Samuel; Parsons, William S.; Charny, Israel W. (eds.). Century of Genocide: Critical Essays and Eyewitness Accounts. London: Routledge. ISBN 978-0-415-94430-4. Werth, Nicolas (2010). "Mass deportations, Ethnic Cleansing, and Genocidal Politics in the Latter Russian Empire and the USSR". In Donald Bloxham; A. Dirk Moses (eds.). The Oxford Handbook of Genocide Studies. Oxford: Oxford University Press. ISBN 978-0-19-923211-6. Wheatcroft, Stephen G. (2001a). "Current knowledge of the level and nature of mortality in the Ukrainian famine of 1931–3" (PDF). In V. Vasil'ev; Y. Shapovala (eds.). 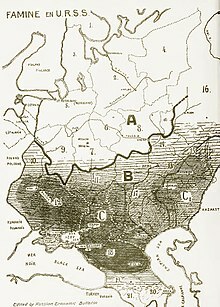 Komandiri velikogo golodu: Poizdki V.Molotova I L.Kaganovicha v Ukrainu ta na Pivnichnii Kavkaz, 1932–1933 rr. Kiev: Geneza. Уиткрофт, С. [Wheatcroft, S.] (2001b). "О демографических свидетельствах трагедии советской деревни в 1931–1933 гг." 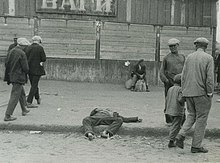 [On demographic evidence of the tragedy of the Soviet village in 1931–1933]. In V.P. Danilov; et al. (eds.). Трагедия советской деревни: Коллективизация и раскулачивание 1927–1939 гг. : Документы и материалы [The Tragedy of the Soviet Village: Collectivization and Dekulakization 1927–39: Documents and Materials] (in Russian). 3. Moscow: ROSSPEN. ISBN 978-5-8243-0225-7. Archived from the original on 20 March 2008.